If you’re looking to truly elevate a space, there is arguably no single design element that adds impact and beauty like stone and tile. And with the exquisite array of materials on the market today, there are countless ways to up the wow factor in your kitchen, bath, living room or foyer. We’ve sourced today’s most coveted treatments and enlisted some of the area’s leading authorities in natural stone to reveal the gems of their collections. Admittedly, it’s hard to talk trends when discussing materials that have graced the Parthenon or the hands of Michelangelo, but try we must. 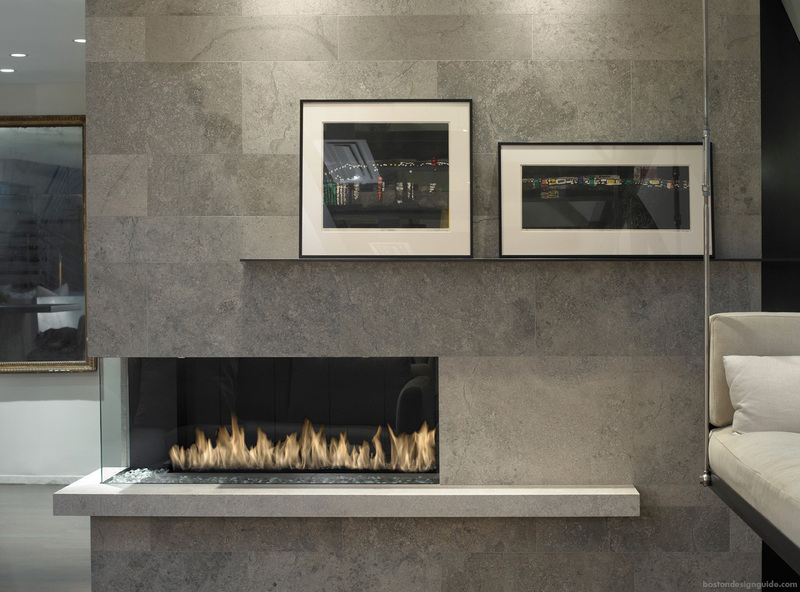 Care and Maintenance Manager Stephanie O’Brien of Cumar, Inc. relays that, here in Boston, we’re enjoying more frequent encounters with natural stone, as commercial properties and residences are using slab stock lavishly in lobbies and flooring, walls and ceilings. 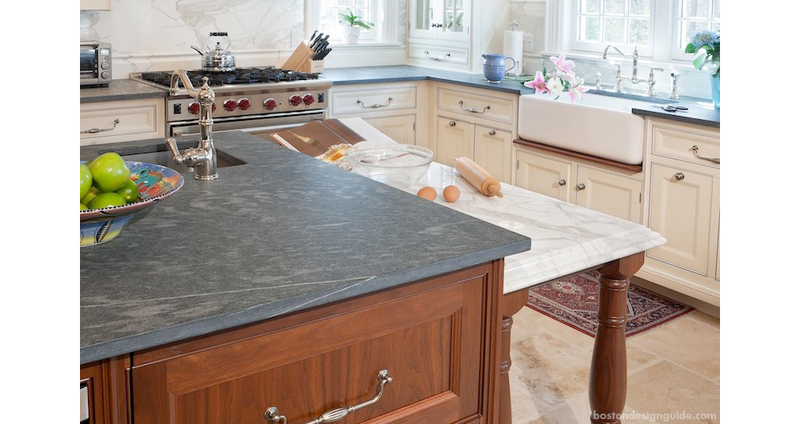 “In Europe, it’s ‘normal’ to have a Carrara countertop, as natural stone has been within their culture for so long,” she explains, but in the U.S., it has taken longer to catch on. Now, projects with natural stone are popping up throughout the city, and it’s satisfying to see, she says. 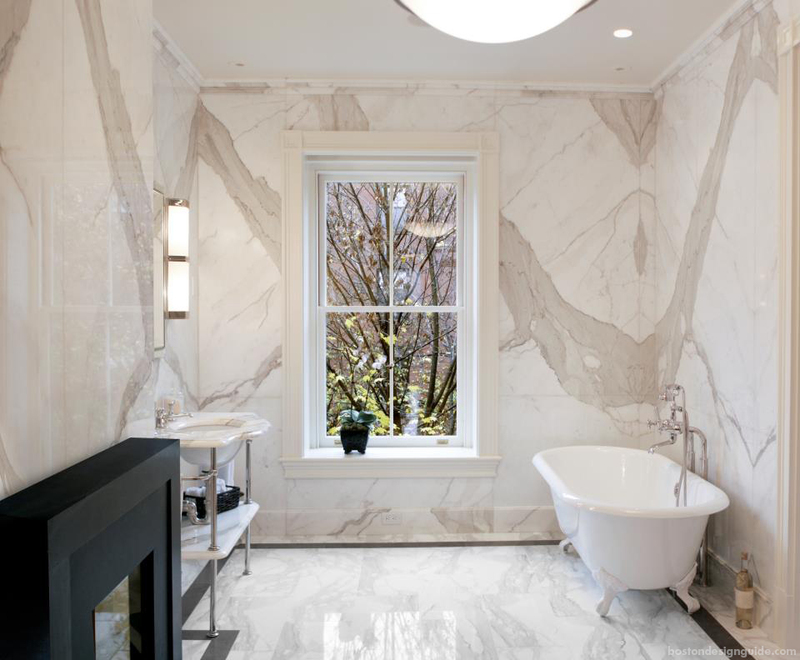 White marble bathroom by PEG Properties & Design; stonework by Cumar, Inc.
Jonathan Verrengia, Sales Manager of Marble and Granite, Inc., concurs. In Europe and Italy, he says, you won’t find granite countertops. “All they use is marble, and they talk about the patina as it ages.” Americans have now embraced marbles as well. “Everything you see now is marble,” he says, adding that the material has stolen the popularity mantle from granite. 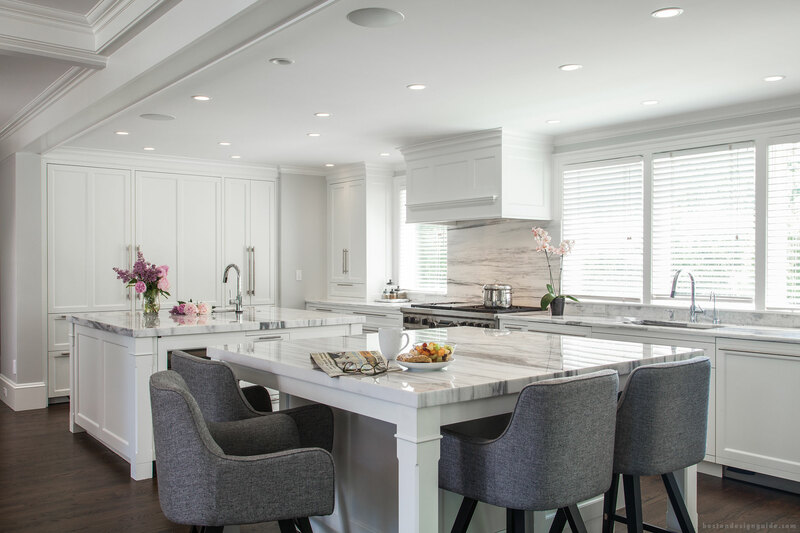 A self-proclaimed “stone guy,” Verrengia extols marble’s unparalleled aesthetic value, as shown in the fresh-as-cream kitchen below, featuring the lustrous, subtly veined Bianco Statuario on the wraparound counters and backsplash. Bianco Statuario; stonework by Marble and Granite, Inc.
He’s not alone. 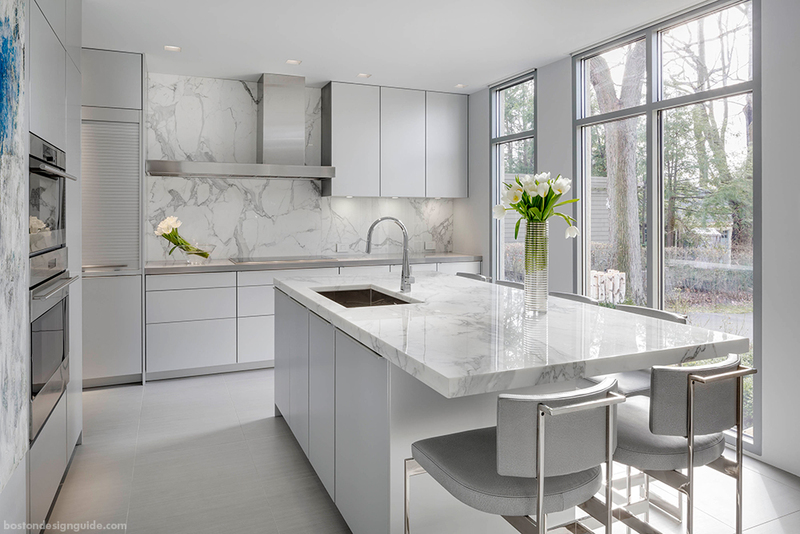 Homeowners are attracted to the pristine, polished beauty of white marbles, Calacatta being the elite and Statuario and Carrara close on its heels. In the kitchen design below, United Marble Fabricators sculpted the top-tier stone to form a laminated honed Calacatta baking counter and full-height backsplash. The counter’s exquisite edge and the custom base and molding of the backsplash are an optimal choice in this historic Concord home. 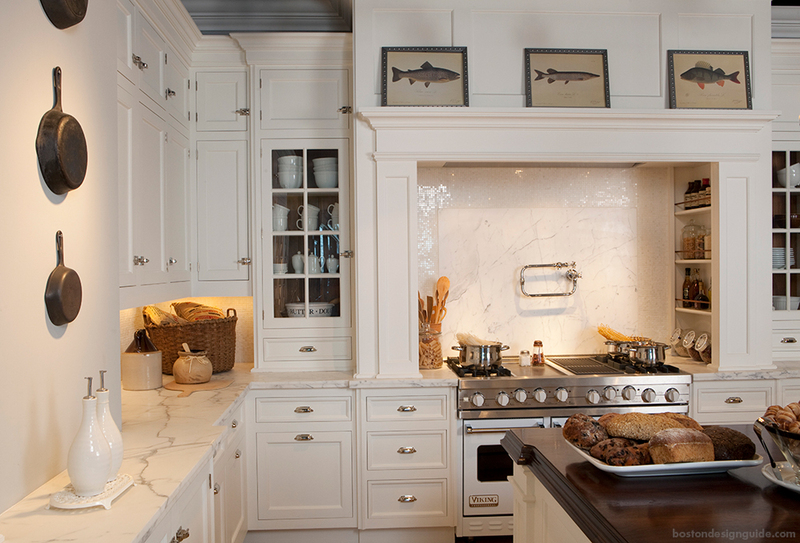 Calacatta again makes the difference in the show-stopping kitchen above. 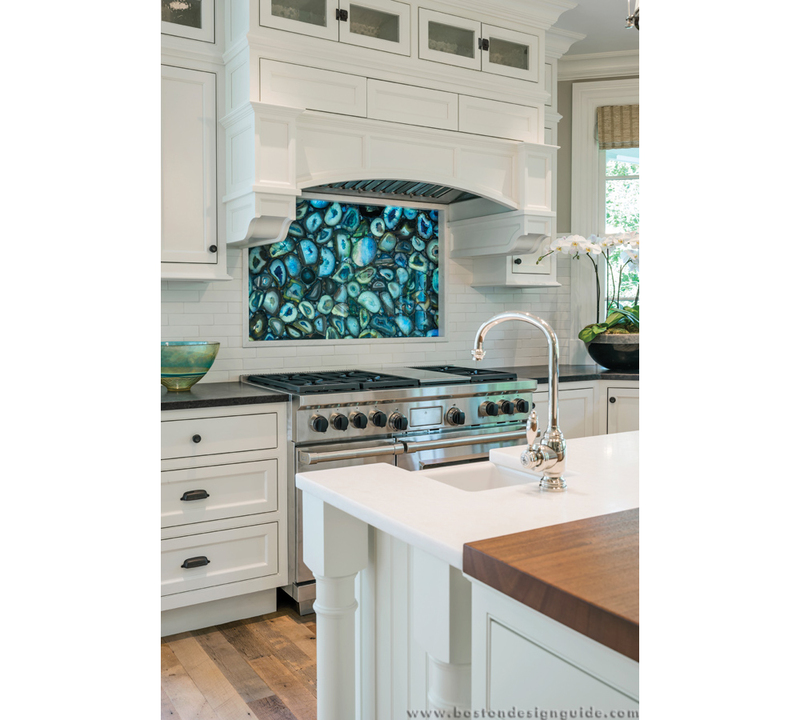 The classically inspired kitchen is enveloped in 2 ½” honed marble blessed with a custom designed edge. 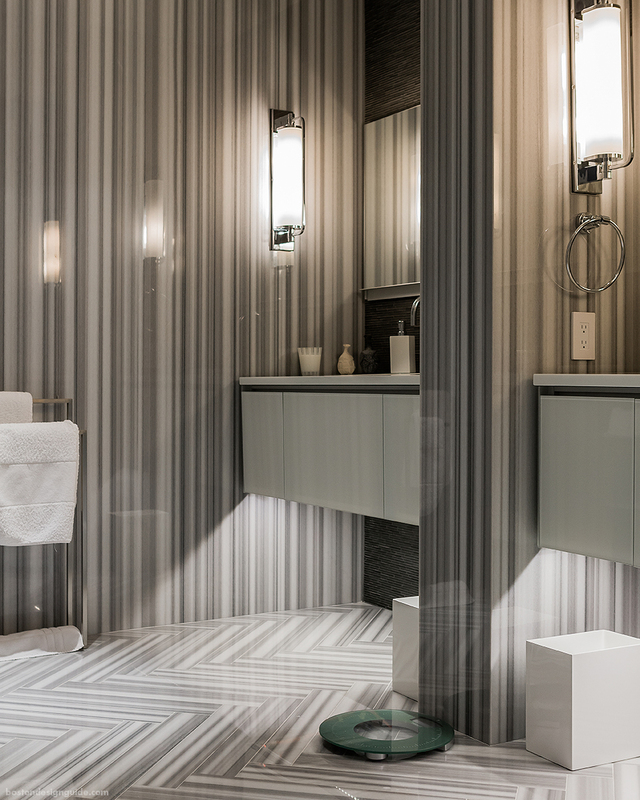 The treatment showcases United Marble Fabricators’ mastery of craft; the edge profile is worked into the recess of the farm sink, and a bookmatched windowsill adorns the backsplash. White Calacatta marble; design by Poggenpohl Kitchens; stonework by Cumar, Inc. While typically marble strikes a traditional pose, that isn’t the case in the dazzling Poggenpohl kitchen above with stonework by Cumar, Inc. Here, the luminous marble takes on the more linear, contemporary effect of the clean-lined space, its sweeping fields of Calacatta throughout proving O’Brien’s adage that the larger you can keep the pieces of stone, the better. 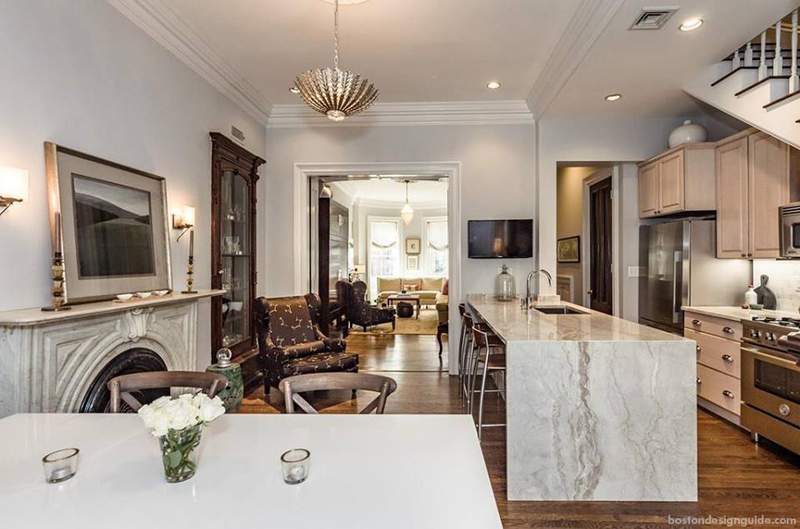 While “visually, marble is what the homeowners want,” maintains O’Brien, “it’s our job to educate them on how to take care of it.” There’s a level of maintenance required, as well as a patina that develops over time, creating a “lived-in” effect. Pietra del Cardosa sandstone; Marble and Granite, Inc. These stone specialists offer a wealth of materials beyond granite, marbles and natural quartzes, and have sources and relationships with quarries all over the world. As a result of their efforts, clients can achieve just the right look for their home with their choice of material. Marble and Granite, Inc.’s blue-gray sandstone Pietra del Cardosa (pictured above), for example, lends itself to a more rustic, country feel. And then there is the allure of Paris Ceramics’ limestone. 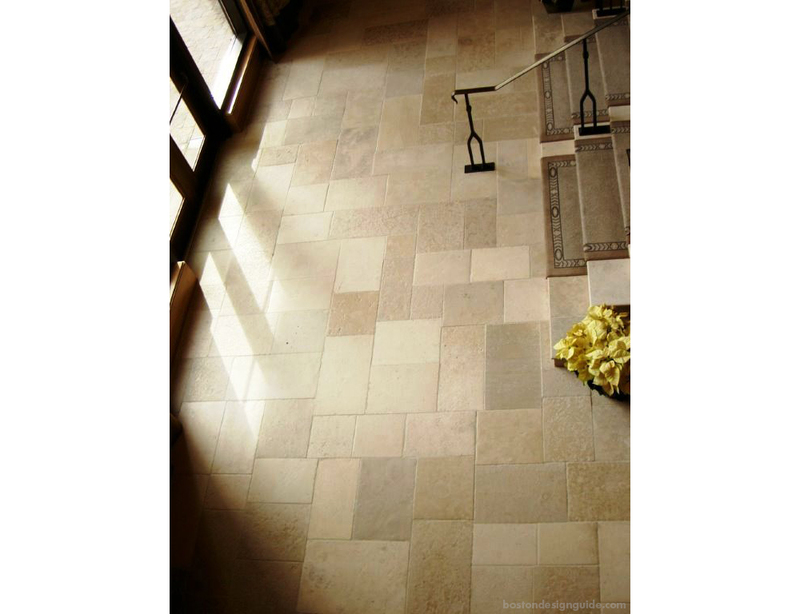 This sought-after French stone adds magnificence to foyers and hallways and is prized for its rich color, character and nuance. A versatile and hardy stone, limestone complements architecture of all types, and can work as a foil for both traditional and contemporary interior designs. 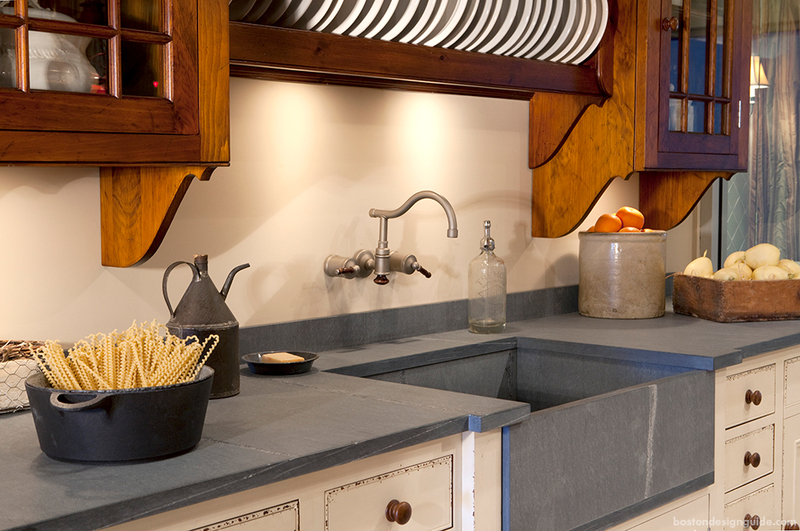 Limestone’s natural tones, in a full spectrum of warm to cool hues, lend themselves to treatments great and small. While durable, the material can be shaped and hard carved, which makes it extremely popular for fireplace surrounds and hearths, and ideal for bathrooms and architectural details. Since we’re all for a big finish, we saved the industry’s jewels for last. These stunning stones add dazzle to design, creating truly unique and memorable spaces. 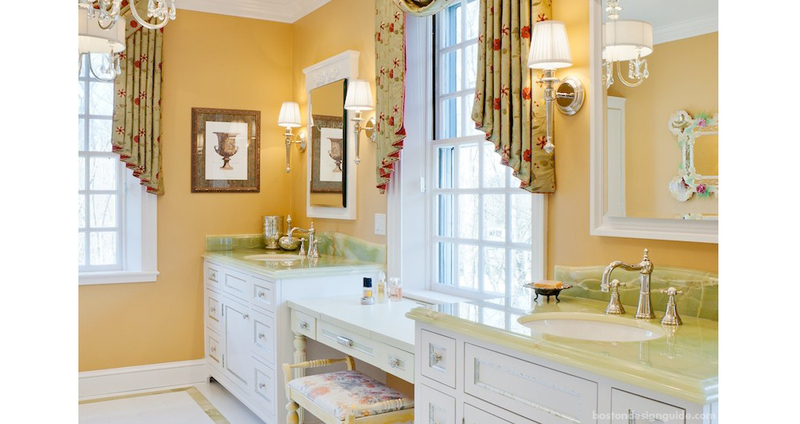 Just look at the effect that United Marble Fabricators’ laminated Jade Green Onyx countertops and hand carved chair rail moldings have on the sunny and elegant master bath, above. Cumar, Inc.’s Linea Couture line of semiprecious stones also leaves us breathless. These are special pieces, maintains O’Brien, generally used for a full-height fireplace surround, a feature wall, a kitchen island or another space worthy of such eye candy. These semiprecious stones mix well with natural quartz, and are emblematic of the challenging custom projects that Cumar, Inc. is known for. Glow Quartz, backlit; Cumar, Inc.
Blue Agate, backlit; Cumar, Inc.
“Designers are really getting creative with natural stone,” enthuses O’Brien. They’re having more fun with it, mixing materials and patterns and capturing the stone’s brilliance with backlighting. Doing so brings yet “another layer of beauty” to the exceptional natural stone, as well as an added dimension.